A major player in the consumer digital camera market, Nikon has made a splash with its popular Coolpix line of cameras, and its feature-laden D-series SLRs. On this page you can view ratings, features, and prices of the Nikon digital camera line. 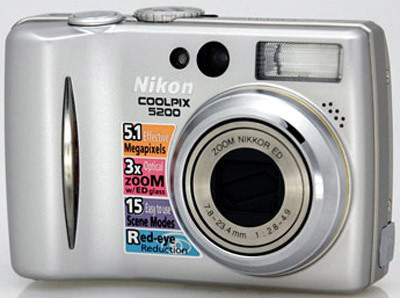 The Nikon Coolpix 5200 is primarily meant as a point-and-shoot model. Although it has some manual control options, without a Manual mode, the user is limited to tweaking the Auto mode, instead. The camera is small and sleek, and is lightweight enough to be easily slid into the back pocket of a pair of pants. The meager body holds a 1/1.8-inch, 5.1 effective megapixel CCD, and a 1.5-inch LCD, which is a little on the small side. The fast menu controls makes this camera perfect for the point-and-shoot user looking for a camera with clean lines that’s easy to use. The Nikon Coolpix 5200 retails for approximately US$499.95. To test the camera’s color production, we expose a series of images of our GretagMacbeth color chart and run the images through Imatest imaging software. The software measures the accuracy of each hue produced and determines the degree of variance from color’s ideal. 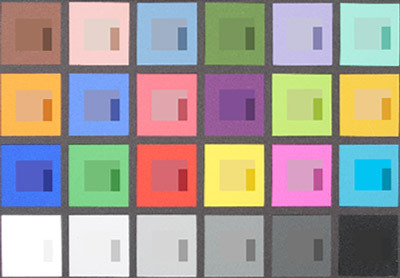 The image below is composed of 24 color tiles, for each tile the outer square is the actual tone produced by the camera, while the inner square is that color corrected by the software, and the smallest, inverted rectangle is the ideal tone. 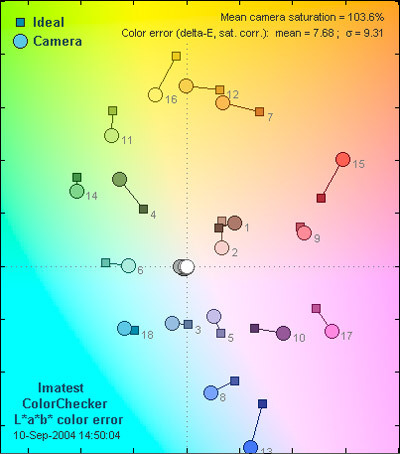 Below is a graph representing the color reproduction of the Nikon Coolpix 5200 and the degree of error from the color’s ideal. The circles represent the colors produced by the camera, while the squares represent the ideal. 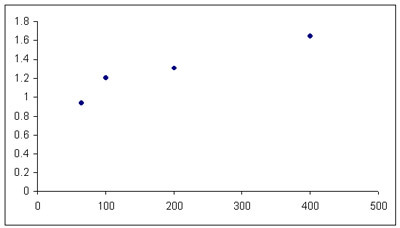 The distance between them is the extent of variance. From the graph above, it is apparent how much the Coolpix 5200 relies on over-saturated tones to gain depth in its imagery. While most cameras exaggerate some tones a bit for richness and vibrancy, most do not to the extent of the 5200. In particular, the blue, green, red, yellow, and orange tones all have difficulty in naturalistic rendering of tones. There is some consistency in the both the degree and direction of error (moving towards the edge of the page is over-saturation, towards the center is dulled), however, many of the tones produced by the 5200 stray from the ideal. The degree of error is not extreme in any one hue, however, all-in-all color rendition is not a particular strength for the Coolpix 5200. 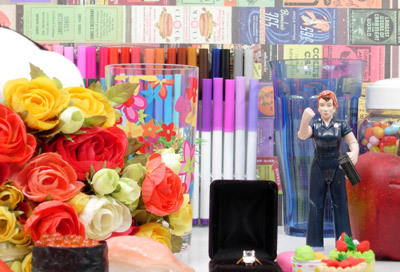 Below is a shot of our still life scene taken with the Nikon Coolpix 5200. While Nikon states the resolution of the Coolpix 5200 to be 5.1 megapixels, our tests reported 3.7 megapixels of resolution produced in the tested images. While this may seem meager in comparison, the 73% actual resolution is an acceptable score. While 80% and above is desired, a score exceeding the 70% mark is respectable and should not detract from the camera’s appeal. If is pure resolution your after, perhaps another alternative is necessary, however, if your intrigued by the camera, the image clarity will not be much of a disappointment unless large prints are made. Unfortunately, the Nikon Coolpix 5200 did not fair too well in terms of noise production. With a point and shoot camera, automatic ISO control is crucial for image clarity as well illumination. While the 64-400 ISO range available on the Coolpix 5200 is reasonably flexible for a point and shoot camera, images recorded in extreme brightness (on low ISO settings) appear washed out while images taken in lower light (ISO 200, 400) are extremely noisy and distorted. With difficulties on both ends of the spectrum, the Coolpix 5200 user does not have any opportunity to attain clean, visible images. This is extremely disappointing and follows our testing conducted on the Coolpix 3700. While there is no questioning Nikon imaging prowess on higher end products, they do not appear to utilize the same technique or knowledge on lower end models. Unlike some lower Coolpix models, the 5200 does contain automatic ISO controls. This is necessary given the difficulties the Coolpix cameras seem to have controlling noise in automatic ISO mode. Unfortunately, manual ISO can only provide the user increased control and the opportunity to get the best image the camera is capable of. It seems most of the Coolpix cameras have trouble controlling noise across the board. Even in an abundance of light, noise levels are still distracting, plaguing the images with distortion. The less light that is available only deteriorates image quality further. By comparison, look at how Sony point and shoot cameras handle noise, both in manual and automatic ISO modes. The equitable Sony DSC-W1 and P100, which are both 5 MP imagers, maintain moderate levels of noise even in far less illumination. This does not speak highly of Nikon’s imaging performance among the point and shoot ranks and places them in a more select position as a specialized manufacturer. The Nikon Coolpix 5200 has a retractable 3x optical zoom lens which, when retracted, leaves the slightly raised right-hand grip as the largest protrusion from the camera’s otherwise sleek and square design format. The metallic silver body of the camera is not overwhelmed by external controls or buttons, and the 1.5-inch LCD monitor fits neatly onto the back of the camera without seeming overwhelming or overwhelmed by the rest of the camera body. The viewfinder is awkwardly placed, relegated to the upper left hand corner on the back, and its dull gray design and miniscule size leave something to be desired aesthetically. The microphone is placed so my left hand covers it completely and obscures the audio. The design of the Nikon Coolpix 5200 makes it a great candidate for a user looking for a portable digital camera that is capable of being slid into a pocket and forgotten about after use. It doesn’t need its own carrying case or excess gear. The lightweight body is highly appreciated, although I worried during testing about durability or strength if dropped or mishandled. The Nikon Coolpix 5200 is fairly straightforward for a beginning user. Set-up is fast, the menus are easy to navigate, and with 12 MB of internal memory, one can take pictures almost immediately. The concerns I have come from its small size. The placement of the microphone and the position and size of the viewfinder make shooting in some modes or situations more complex than necessary. For example, my fingers overlapped the left side, effectively blocking not only the microphone, but the flash as well. 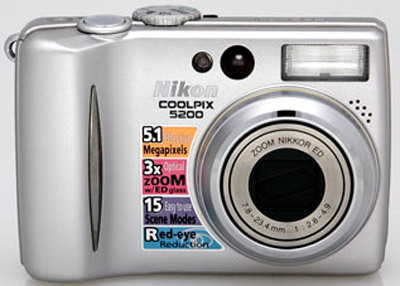 The Nikon Coolpix 5200 has few external features on the body of the camera. Those that are present are large and placed comfortably for quick and easy access without the aggravation of mistakenly pressing the wrong button or nudging the wrong dial. The Mode Dial is small, but has only eight different settings, making this feature even simpler for the point-and-shoot user. With settings like “scene” being located on the Mode Dial, but accessed through the LCD menu, the Nikon Coolpix 5200 consciously splits the control process into appropriate subsections. My only major concern is with the viewfinder. Other manufacturers have done away with this feature entirely, admitting that stunted viewfinders are hardly ever used if the user is given the option of a clear and easily viewed 1.5-inch LCD screen directly below it. The front of the Nikon Coolpix 5200 is dominated by the 3x optical zoom, which has a total zoom capability of 12x when one factors in the 4x digital zoom. (As always, when digital zoom is engaged, the quality of the overall image will be compromised.) With the lens of the Nikon Coolpix 5200 occupying most of the left side, the microphone runs along the upper left side of the lens housing, and is indicated by seven small dots. Above the microphone and lens is the internal flash for the camera. To the right of the internal flash is the viewfinder window, with the Self Timer Lamp/AF Assist Illuminator LED located beside it. Running along the right side of the front of the camera body is a raised grip for the camera, with a sliver extending out for the user’s fingers to curl around. The upper left corner on the back of the Nikon Coolpix 5200 holds the real-image viewfinder, with the flash and AF lamps located beside it. All these are raised slightly from the camera body and encased in a rectangle of dull gray plastic. Below the viewfinder, and perfectly positioned to get one’s nose grease all over it if the viewfinder is used, is the camera’s 1.5-inch LCD screen. Underneath the LCD screen are, from left to right, the delete button, the Menu button, and the play button. To the right of the LCD screen is the four-way controller for the camera, which allows for dual control as well as navigation. The up arrow controls Flash settings, the right arrow controls Exposure settings, the down arrow controls Macro mode, and the left arrow sets the self-timer. The centrally located enter button doubles as a transfer button during playback. 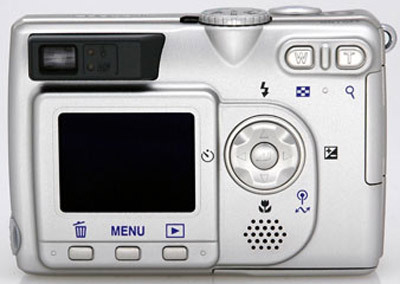 In the upper right corner, on the back of the camera body, the user will find the Zoom buttons, which control the degree of Wide Angle and Telephoto being engaged by the user. When in playback mode the Wide Angle button allows for Multi-up viewing format, and the Telephoto allows for Playback zoom. The only component featured on the left side of the Nikon Coolpix 5200’s camera body is the USB A/V-out port located underneath a somewhat flimsy port cover. The right side features a slot for a memory card, located underneath a cover that is slid backward. A wrist-strap eyelet is located at the top of the camera body. The top of the Nikon Coolpix 5200 has its on/off button located toward the right side in the middle of the camera body. The shutter button is slightly in front of and to the left of this button, and is both large and comfortable to engage. Further left is the Mode Dial, which has eight separate settings which control shooting modes: Auto, Scene, Portrait Assist, Landscape, Sports, Night Portrait, Set Up, and Movie. This dial could be a little hard to decipher and use comfortably under low light; an LED underneath would have greatly enhanced this feature. The Coolpix 5200 has an extensive Menu that is accessible by pressing the “menu” button, located directly below the LCD screen. The menu varies depending on the mode that is being used. In the general shooting mode, there are 13 sub-sections to select from in total, depending on the aspect of the image you want to alter. The sections available to choose from are, Image Mode (image size, image quality), White Balance, Metering, Continuous, BSS (best shot selector), Image Adjustment, Image Sharpening, Sensitivity, Auto Bracketing, Saturation Control, AF area mode, Auto-Focus Mode, NR – Noise Reduction. This is an elaborate menu, providing the user with opportunity to customize the image far beyond most point and shoot cameras. The menu mode is easy to access and navigate and is one of the best features the Coolpix 5200 has to offer. When the camera is in Auto Mode, the user can allow the Nikon Coolpix 5200 to establish exposure, white balance, aperture, shutter speed, and so forth for the entire image. However, unlike many cameras that freeze all user controls when the camera is in Auto Mode, it is possible to change one or more parameters of the camera’s settings independently while allowing the rest to be established by the camera. The Auto Focus for the Nikon Coolpix 5200 is a bit troublesome. Once the shutter is pressed partially to engage, it still takes two or three seconds to settle the focus and prepare the shot for image capture. If the user scans through the menu, they can access the AF Area Mode, which allows them to decide among Off, Center, and Manual focus. When in manual mode, the user can adjust the focal area, using the four-way controller and the LCD screen to adjust for more complex situations. However, this setting isn’t the fastest to engage or use in most situations. Beneath the Area Mode setting is the Auto-Focus Mode subsection, which allows the user to select between Continuous or Single Focus modes. Manual controls that are available for the Nikon Coolpix 5200 are White Balance, Exposure, Flash, ISO, Metering Parameters, Image Size and Quality, Burst Mode, Custom Image Presets, and Zoom, among others. However, many of these modes are “manual” only in the sense that the user can choose among different manufacturer presets. Although you can use the Auto Focus to select from among fixed settings, there is no true manual focus setting available for Manual Focus on the Nikon Coolpix 5200. The white balance is controlled through the Menu button. A user can choose from among the following settings; Auto, White Balance preset, Daylight, Incandescent, Fluorescent (FL1 or FL2), Cloudy, Shade, or Speedlight. The ISO sensitivity settings for the Nikon Coolpix 5200 are also available in the onscreen LCD menu, under the heading of Sensitivity ISO. The available settings are Auto, 64, 100, 200, and 400. The higher the rating, the more sensitive the camera will be, and the more feasible it will be to shoot under low light situations. However, it should be noted that more grain or noise will occur when higher ISO settings are engaged. The Exposure settings are controlled by pressing the right arrow on the four-way controller during regular shooting mode, which will display an exposure scale on the LCD screen of the Nikon Coolpix 5200. The ratings are -2, -1.7, -1.3, -1.0, -0.7, -0.3, 0, +0.3, +0.7, +1.0, +1.3, +1.7, and +2.0. The lower the setting, the less light is allowed into the image being captured, and the darker the image will appear on the LCD screen. Metering options for the Nikon Coolpix 5200 are located under the metering subsection of the Menu, where the user can choose among Matrix, Center-weighted, and Spot modes. Matrix considers the settings from multiple portions of the image frame evenly, Center-weighted focuses on the center of the image frame, and Spot mode considers the light within the circle displayed on the LCD screen. No manual control settings are available in regards to shutter speed on the Nikon Coolpix 5200. There are no aperture settings available to the manual control enthusiast when using the Nikon Coolpix 5200. Custom image presets are accessed by first switching the Mode Dial to Scene mode, and then entering the onscreen Menu and choosing one of the preset parameters that best fit the shooting situation. Listed, they are Party/Indoor, Beach/Snow, Sunset, Dusk/Dawn, Night landscape, Close up, Museum, Fireworks, Copy, Back light, and Panorama Assist. Burst Modes are available in the Continuous menu subsection on the Nikon Coolpix 5200. The user can choose from among the following settings: Single/Default, Continuous, 5-shot buffer, and Multi-Shot 16 modes. For the five-shot and continuous modes, shots will average 2.5 shots per second. Multi-Shot garners the user 3.5 images each second. The Image Quality settings available are Fine, Normal, and Basic, with image size settings of PC (1024x768), TV (640x480), 1600x1200, 2048x1536, and 2592x1944. The image sharpening subsection settings in the main Menu of the Nikon Coolpix 5200 are as follows: Auto, High, Normal, Low, and Off. This allows the user to make adjustments to the contrast of the picture. When the camera is placed in Playback mode, it is possible for the user to view previously captured video and still images in either the default slide show setting or a multi-up format, which is engaged by pressing the Wide Angle button. The telephoto lens can be used as a playback zoom, allowing for images to be viewed in a slightly compromised close-up. It is possible for the user to shoot movies at three different sizes: TV Movie (640x480), Small Size (320x240), and Smaller Size (160x120), each at 30 frames per second. Playback for movies is also available, and onscreen controls are activated via the four-way controller. The viewfinder for the Nikon Coolpix 5200 is a real image zoom viewfinder with LED indicators. It’s so small that its presence on this camera is fairly laughable. My eyelashes were constantly in the way. The LCD screen, unlike the viewfinder, seems logically sized for the camera’s petite body. The screen measures in at a usable 1.5 inches, diagonally. Though this is not too expansive by current trend standards, the most disappointing element is the 110,000 pixels of resolution used to compose the image. This is quite meager when it is really all the user has to rely on and seems to be the bare minimum used on any screen at this point. The LCD is also susceptible to solarization, needing to be viewed from head-on. It seems Nikon, unlike Sony, views the LCD as a secondary element on point and shoot cameras and scales the screen down to the compact frame. This may result in unnecessary viewing strain and create difficulty in framing when not in optimal conditions. The Nikon Coolpix 5200 does not have an external flash jack, leaving the user with the internal flash as their only option. To control the flash setting, the user must press the up arrow on the four-way controller and select from among the following options: Auto, Auto with red-eye reduction, Flash cancel (off), Anytime flash, and Slow Sync. The Nikon Coolpix 5200 is equipped with a 3x optical, 4x digital Nikkor Zoom, which is controlled via the Wide Angle and Telephoto buttons located on the back of the camera in the upper right hand corner. The equivalent zoom range is 38-114mm with minimum f-stop ratings of f/2.8-f/4.9 to provide some speed to the lens. There are 12 MB of internal memory available for the Nikon Coolpix 5200. The camera unfortunately does not come with the optional Memory Card that fits in the slot on the right side of the camera body. It is highly advised that the user purchase a memory card. Twelve MB of memory will not be able to store many photos of any size or quality, and movies will be virtually impossible to record without the card being used. Like an old car, the Coolpix 5200 takes a while to get started. Once moving, it speeds up a bit, but if it’s an instant shot you desire, better charge the battery and leave the camera on because the Coolpix 5200 is not quick enough to catch any fleeting scene from the off position. Once the camera is on and ready to shoot, the Coolpix 5200 can record images pretty rapidly. While shot-to-shot timing is not stellar once the shutter has been fully released (taking nearly 5 seconds between shots,) if held down, the Coolpix 5200 will record subsequent images within 5/10 of a second of each other. This shows a bit of the speed that is so unique on the D70. From the time the shutter is depressed, the Coolpix 5200 needs .91 of a second to capture the image. This is fairly quick but may not be enough to prohibit unwanted motion in all occasions. The Nikon Coolpix 5200 comes with Nikon PictureProject 1.0 for Windows and Macintosh platforms. There is only one port available on the Nikon Coolpix 5200, and this port is located on the left side of the body in the lower back corner. This port is the USB A/V out port. Otherwise, the optional Memory Card slot is located on the right side under it’s own cover, and the battery port is located on the bottom of the unit. It is possible to engage in Direct Print with the Nikon Coolpix 5200, as long as the printer is PictBridge compatible. With easy-to-follow menu settings, for the most part the Nikon Coolpix 5200 is a camera intended for the point-and-shoot consumer who has basic knowledge of some manual control settings and their appropriate parameters. However, some controls, like the manual manipulation of the Auto Focus, are too slow and discombobulated to make any sense. (Unless, say, your subject is dead or inanimate.) Otherwise, the only major complaint is that my hand obscures some of the features located on the left half of the camera’s front face, like the microphone and, at times, the flash. I was greatly pleased that the small size still allowed for neatly spaced controls and fast and easy access to the camera’s modes. Voice memo - This feature allows the user to overlay voice messages upon previously captured still images, allowing for images and audio to be viewed and experienced simultaneously. 15 Scene Modes - The Nikon Coolpix 5200 has 15 scene modes available when the camera is set to Scene on the Mode Dial, allowing the user to shoot in a greater variety of shooting situations. Noise Reduction - When users shoot in inclement conditions with slow shutter speeds, there is the possibility for noise, or discoloration, to occur within the image. The Nikon Coolpix 5200 has Noise Reduction, which allows for a higher quality, more accurate picture to be taken. Self Timer 3 and 10 sec. Built in Flash Auto On/Off, Red-eye reduction, Anytime Flash, Slow sync. This camera by Olympus is a perfect example of a camera priced at slightly less than the Nikon Coolpix, but equipped with a larger 6.1 MP CCD. It admittedly has a larger size, and a more traditional construction based upon older film cameras. However, if the first thing to be considered isn’t size or style, then this camera may make more sense. It also has a larger, 1.8-inch LCD screen. Its movie mode rate, however, is only 15 fps, as compared to the Nikon’s 30 fps. This camera fits into the sleek style department with the Nikon Coolpix, emphasizing compact and transportable design as one of the key features of the camera. Unlike the Sony Cyber-Shot DSC-T1, it has a viewfinder as an option besides the LCD screen. It retails for US$449.95, making it slightly less expensive than the Nikon, and comes with a 5.1 MP CCD, 3x optical/2x digital zoom, and a 1.8-inch LCD screen. It’s primarily a point-and-shoot camera, and like the Olympus, has a slower fps movie rating than the Nikon, registering at approximately 16 fps. Nikon Coolpix 5400 By featuring this camera, which retails for approximately US$599.95, it allows for a comparison to be made between related Coolpix models, and shows the prospective consumer what slightly more money can buy. With a 5.1 MP CCD like the 5200, the 5400 has a 4x optical zoom paired with a 4x digital zoom. It has a slightly larger build, and an advanced point-and-shoot style. There are more manual features and presets available, such as focus, with the 5400, along with external flash ports. However, it still has the small 1.5-inch LCD screen — an oddity in a market driven by increasing LCD size. This model by Sony features a 5.0 MP CCD, a 4x optical zoom, video and audio recording, some manual control, a memory stick, and a 1.5 inch LCD screen. It retails for the same price as the Nikon Coolpix 5200, but does not have Direct Print Capabilities. This camera can however support an external flash, along with the internal flash of the camera. With the compact styling and lightweight design and carriage the 5.1 MP CCD, 1.5 inch LCD, and 12 MB internal memory all make the retail price of US $499.95 understandable. However, it is a point-and-shoot camera, with some manual controls, and if a users first concern is money, rather than size or portability when searching for an automatic camera, there are many less expensive, more logical cameras out on the market that have most of the same features as the Nikon Coolpix 5200, with some of the aesthetic aspects being put aside. Point-and-Shooters This camera is wholly intended for the point-and-shoot user, with the preset Scene modes, and other built in features, this camera doesn’t even have a manual setting on the mode dial, making it instantly for this consumer. Budget Consumers The Nikon Coolpix 5200 retails for about US$499.95, making it a fairly expensive point-and-shoot camera, although it’s 5.1 MP CCD is nice, less expensive models are available in a slightly larger format and with the same controls. Gadget Freaks This camera is fairly straightforward without a lot of add-ons or even, an included optional memory card. It’s sleek and pretty, but it’s functional, and standard. Manual Control Freaks Manual control within Automatic mode is possible, however, there is really no way to have entire control over any of the images, however, the Auto mode is friendly to manual control, which is an appreciated gesture. Pros/Serious Hobbyists There would really be no reason for the pro or serious hobbyist to buy this camera, due to it’s point-and-shoot sensibility and structure. The Nikon Coolpix 5200 is most likely to appeal to those consumers searching for a point-and-shoot camera with a small compact size and style, few external controls, and simple menus to allow and expedite menu changes. The color menus are attractive and simple to navigate with the four-way controller, and the 1.5 inch LCD is a bit small, however, the overall small size of the camera makes this perhaps inevitable. The 5.1 MP CCD is large enough to produce high quality photographs, and when paired with a movie mode frame rate of 30 fps, this camera becomes an impressive and attractive choice for those users not concerned with spending more to look better. The manual controls that do exist work in co-existence with the Auto mode, and do not overwhelm the user, and are easily accessed either through external controllers or the simple menu structure. 15 Scene Settings allow for even more point-and-shoot options, illustrating that even though this camera is meant to be used as such, that doesn’t mean that the consumer must relinquish all control over image options, an appreciated gesture that is repeated throughout the entire system structure of the Nikon Coolpix 5200.